Nicholas “Nick” Jensen, of Panama City, Florida was born with Ebstein’s anomaly, a complex form of a congenital heart disease. Shortly after he was born, physicians advised that his parents take him to pediatric cardiologists at the UF Health Shands Children’s Hospital for further evaluation. That decision set him on a health care journey that continues to this day. Now 25, Nick has been a patient of the UF Health Congenital Heart Center virtually his entire life. Nick Jensen was born with Ebstein's anomaly, a congenital heart disease, and has been cared for by UF Health physicians all of his life. He is among a growing number of patients nationwide who face the challenges of transitioning from pediatrics to adult care. 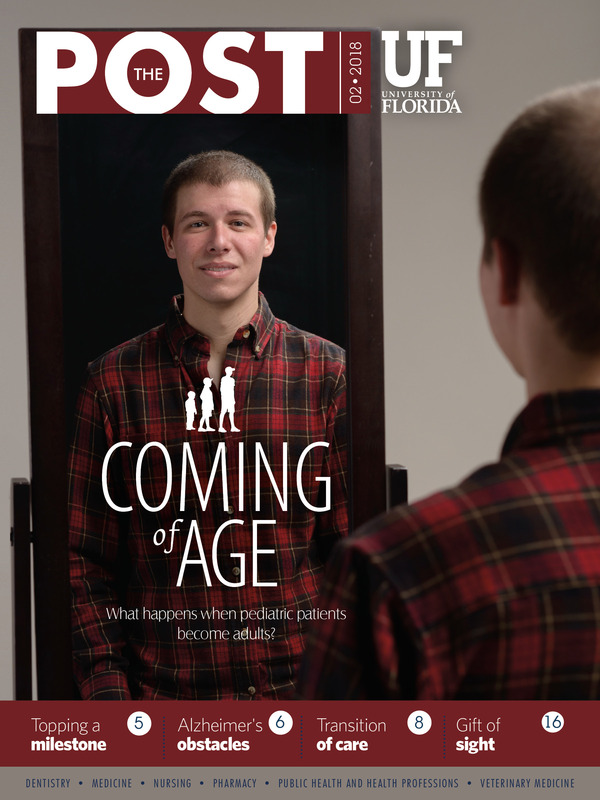 In recent years, physicians at UF Health and other health centers have been establishing programs to assist patients who decades ago would not be expected to live into adulthood. “This is the so-called medical miracle promised to our parents and grandparents,’’ said Patrick Burke, M.D., a pediatrician in Madera, California, who heads a new transitional care program at Valley Children’s Healthcare. Along with their physical challenges, these patients face a number of hurdles in their transition, such as obtaining insurance coverage, a lack of education about their condition, and relocation. Youth with disabilities are much less likely than their nondisabled peers to finish high school, pursue postsecondary education, find a job or live independently. Over the past 15 years, for example, UF Health’s transition of care team for cystic fibrosis has tried different approaches. The most recent innovation has been a joint transition clinic, where older teens meet the adult group, with the comfort of their familiar pediatric team present. After this visit, they may choose to go directly to the adult program or they may choose to return to pediatrics and attend a few more transition visits. “As soon as children can understand and converse with their medical team, we try to include them in the conversation about their diagnosis and the medication and treatment that are associated with it,” said Susan Chauncey Horky, LCSW, a UF Health social worker who has worked with people with cystic fibrosis and their families for a number of years. In 2008, Nick Jensen was 16 when his pediatric cardiologist began preparing him. Once he turned 18, Nick would be switching to see Arwa Saidi, M.Ed, MBBCH, FAAP, FACC, a co-director of the UF Health Congenital Heart Center’s adult congenital cardiology program. It was all part of a plan to make the transition orderly and seamless. “All of our pediatric cardiologists know that patients are supposed to transition to either Dr. Saidi or myself when they turn 18,” said Diego Moguillansky, M.D., a co-director of the UF Health Congenital Heart Center’s adult congenital cardiology program. Moguillansky is an assistant professor in the UF College of Medicine, and Saidi is a professor in the UF College of Medicine. By 2010, Nick, then 18, was paying closer attention to his condition. He recognized more side effects, including skipped heartbeats, increased sleep to nearly 14 hours a day and decreased exercise tolerance. Saidi said that although transitional care has been a topic of conversation for years, she has lately seen an emphasis on patient education starting at a younger age, as well as an increase in patient empowerment. Not all patients with congenital heart disease follow the same gradual shift in care. Moguillansky explained that some patients, like Nick, are well aware of their disease, while others have only some idea or are in the dark about their condition. “There are multiple modes of transition. Patients who are already within our program transition to an adult congenital cardiologist at 18. Then, there are patients who come from outside (of UF Health) and there are different reasons why they come to our program,” he said. “We have patients who have never transitioned and something happens like pregnancy. Sometimes, transition is initiated by the patients when they hear ‘adult congenital,’ and they perceive that they aren’t getting the ideal care they need. Other times, patients come to us needing services that aren’t provided anywhere else, like complex imaging, evaluation for transplantation, or procedures that require extensive coordination of care,’’ Moguillansky said. At 6 months old, Ashleigh Godfrey was diagnosed with cystic fibrosis, or CF, a genetic defect that causes a buildup of bacteria in the lungs and can lead to severe respiratory issues. Depending on the severity of a patient’s symptoms, treatments can take one to three hours per day and continue throughout a patient’s entire life. UF Health Shands Children’s Hospital. Now 19, Ashleigh will have to manage her health as an adult. She is grateful for the care she received as a child as well as the guidance she is getting from UF Health’s CF program’s joint transition practice as she moves into the next stage of her care. According to Horky, the goal is for patients to be transferred to adult care by age 21; however, if there are patients who need a little more time, they do allow a slower transition. Horky explained that physicians in the pediatric CF program start focusing more intentionally on helping a child take charge of his or her own health around age 12. Questions are asked to ensure the child knows about his or her medications, understands the medication dosage for each prescription and knows how to store the medications properly. Not all young patients transition into adult care. Sometimes, it’s in their best interest to remain with their pediatric physician. Muhammad Hasan’s parents started noticing some issues when he was a child growing up in South Florida, like his hip continually coming out of its socket. Physicians diagnosed him with neurofibromatosis type 1, or NF1, a disease that causes benign tumors to form throughout the body and can lead to other issues, such as severe edema, muscle atrophy, bowleggedness, scoliosis and osteoporosis. His family moved to Gainesville and he spent much of his childhood at UF Health’s orthopaedics office. His parents became his biggest advocates for his health and took him to every appointment, ensuring he got the care he needed. It wasn’t until he became an adult that Muhammad, now 27, fully understood he wouldn’t be like everyone else and that his life was intertwined with his care, permanently. As he started going to doctor’s appointments without his family, he found that his own research, coupled with the advice of physicians he had seen since he was a child, helped him make the best decisions for himself. Many childhood diseases like NF1 still have long-term effects into adulthood, but there is a shortage of physicians to care for these transitional patients. At the UF Health Orthopaedics and Sports Medicine Institute, the pediatric orthopaedic physicians continue to see these patients through adulthood and help them navigate the changing health care landscape. Monique Thomas is intimately familiar with the challenges of caring for a child who becomes an adult but cannot fend for herself. Her daughter, Nakia, 19, has a sweet nature and loves to smile and play with her siblings. Nakia has holoprosencephaly, which has required her to be fed through a feeding tube and caused her to develop osteoporosis and arthritis. She also had her right leg amputated. She will never walk or talk. UF Health’s pediatric orthopaedics team. “It’s not about me, it’s about what’s best for her,” Monique said. As Nakia became an adult, Monique faced different challenges, like proving to insurance companies that Nakia still requires full-time care. Monique counts on her own knowledge and the guidance of physicians, including Blakemore, on how to navigate Nakia’s adult life. Monique completed a medical terminology class to make sure she understood every aspect of her daughter’s care and learned to do detailed research on each procedure that was suggested for Nakia before agreeing to it. Monique and her husband work at opposite times of the day so someone is always home to care for Nakia. to help with Nakia’s daily costs, as insurance stopped covering certain things now that Nakia is an adult. Monique takes to social media to encourage other families to reach out to her with questions about how their child’s care will change from childhood to adulthood. She also attends a disability conference every year where her husband, Nakia and their other three children spend time together and with other families facing their same challenges. When asked how she stays positive through the challenges in Nakia’s care, Monique turns the question on its head and echoes a sentiment often heard among caregivers of children who are heroically bearing their burdens.